Even if the south secedes, it will face many hurdles—and possibly violence. It is hard to convey what it feels like in the southern Sudan capital of Juba. The only similar sensation I have to draw on is from an utterly different context—Sydney, Australia, in the build-up to the 2000 Olympic Games. In part, this is because a gigantic international press pool (representatives of some 500 news organizations) has descended on Juba. But mostly it’s because of the vibrancy in the air. Randomly, individuals or groups of youth break into chants of celebration. On the back of the numerous motorbikes shuttling people around town are mini flags proclaiming, “SECESSION 2011!” Regardless of nationality, ethnicity, or social status, people have a common topic of conversation. It’s boom-time for the town’s entrepreneurs—mainly migrants from neighboring countries who have established restaurants and hotels to serve the ex-pat crowd that has come to work for international organizations here in recent years. Parenthetically, it is hellish for the government and UN officials who are dividing their time between doing their actual jobs and responding to media requests (mine included). Emancipation from Khartoum has been a multi-generational struggle for the southern population. President Omar Al Bashir’s National Congress Party is just the latest of successive northern governments that have enforced a policy of Arabization and Islamization on the southern people, resulting in the loss of a staggering two million lives. But finally, it seems the end is in sight. At least that’s how it feels in Juba right now. There is, of course, a very different narrative for the taking. Enormous risks lie ahead on the path to viable nationhood. Assuming voting gets underway as scheduled on Sunday, the risks begin with whether or not Khartoum will recognize the vote if southerners choose separation. 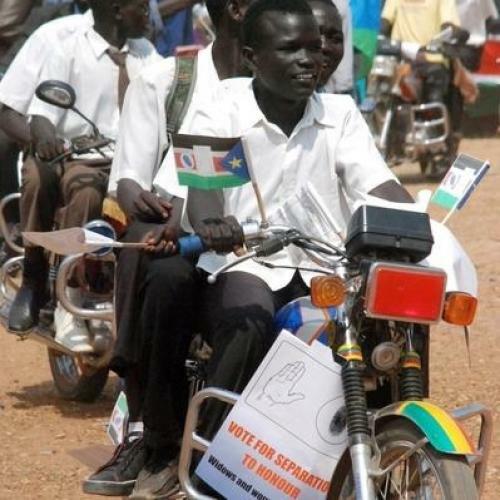 In the worst-case scenario, there could be a return to war—perhaps sparked by the overflow of tensions in Abyei, the border area that should be getting its own self-determination referendum on Sunday but has instead been sidelined (for the second time in its history). But, even absent this much-discussed possibility, Khartoum’s reaction will guide the international conversation over diplomatic recognition of the new nation. And the formal recognition of southern statehood is just the first hurdle. The dire state of southern development is now well-known, thanks to the UN’s aptly named publication, “Scary Statistics - Southern Sudan.” As southern President Salva Kiir told me, health, education, clean water, and food security are vital to the viability of a new nation, “because without these things you cannot have a stable and secure population.” Then, there is the task of governing the southern territory, roughly the size of Texas, with a cadre of civil servants who have spent most of their lives as guerilla fighters. And the challenge of keeping longstanding tensions between the south’s myriad ethnic groups from escalating into violence in a population full of ex-combatants with ready access to arms. In the coming month, I’ll be writing (whenever I have Internet access) as I travel across the south, interviewing a wide array of people about their hopes and expectations for what may soon be the world’s newest nation—and delving deeper into some of the challenges that lie ahead.